Douglas A. Dulli, MD, MS, is a neurologist with medical interests including stroke therapy, stroke secondary prevention, neuroepidemiology, migraine pathogenesis, headache therapy, chronic daily headache, and international and tropical medicine. 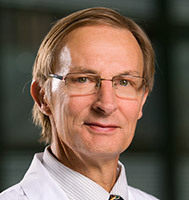 Dr. Dulli’s teaching activities include teaching first- and second-year medical students, as well as supervision of medical students during third-year neurology rotations and in free clinics associated with the University of Wisconsin MEDiC Program. He also teaches the physician assistant stroke modules. He is involved with the University of Wisconsin Global Health program, supervising medical and physician assistant students during elective rotations in Central America, particularly Guatemala and Belize. Dr. Dulli’s research interests include the UW Acute Stroke Data Registry.